Domestic violence, or family violence, is violence or abuse inflicted by one family member on another. There are many types of domestic violence, including physical, emotional and sexual violence. Anyone can be a victim of domestic violence, regardless of age or gender. In this article, we give you an overview of the offences which constitute domestic violence and inform you about the various options you can seek to protect yourself if you are a victim of domestic violence. Can an aggressor acting in self-defence avoid liability for domestic violence? An oft-quoted defence by alleged aggressors of domestic violence is their acting in self-defence. However, this defence fails if self-defence is disproportionate or excessive. 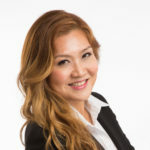 In the case of TED v TEE  SGFC 88, the court heard that during a heated argument, the complainant wife started throwing objects at the respondent husband, who then attempted to strangle the complainant. The complainant alleged that she was the victim of family violence, while the respondent claimed that he merely acted in self-defence. The court found that the respondent had used force disproportionate to the harm/threat caused by the complainant, and that the defence of self-defence did not permit retaliation or reprisal. What can I do if a non-family member is abusive? If you are hurt by someone who is not a family member, for example, an intimate partner who is not a spouse, you may report the matter to the police or take out a private summons against the offender. Where injuries are minor, the relevant offence is that of Hurt, as defined in Section 319 of the Penal Code (Cap 224, Rev Ed 2008). Where injuries are major, such as broken bones or loss of sight, the abuser can be charged with Grievous Hurt as defined in Section 320 of the Penal Code. What can I do if a family member is abusive? The offender cannot incite or assist anyone to commit violence against the applicant. While a lawyer is not necessary in an application for court orders, having a lawyer will be helpful. Why should I get a PPO? You should get a PPO if domestic violence is likely to be committed against you in the future. It is advisable to obtain a PPO if you will be interacting with the aggressor often, such as picking up or dropping off your child(ren) at your (ex-)spouse’s residence. A PPO may also help in proving that it is not in your child(ren)’s best interests for your (ex-)spouse to have care and control of your children. Must I suffer physical injury to get a PPO? Contrary to popular belief, there is no need to show that you have sustained physical injury before you can apply for a PPO. 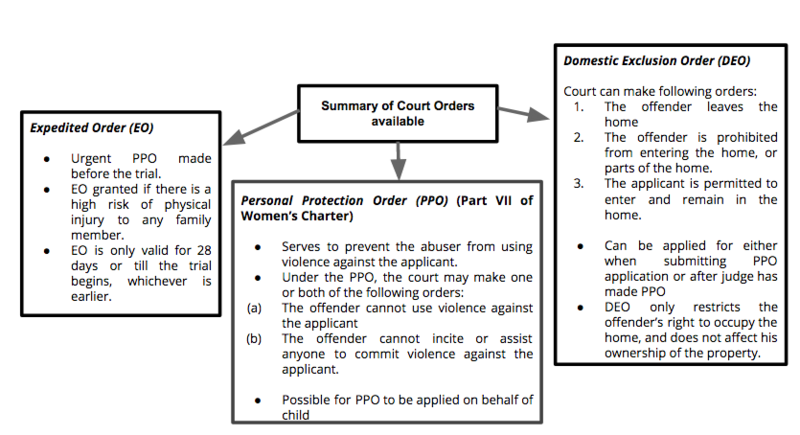 Bear in mind that the court has the power to grant a PPO when it is shown that one or more of the acts of family violence described above is threatened, and some of such acts (e.g. being placed in fear of hurt, harassment, or wrongful confinement) do not necessarily lead to physical or visible injuries. For a PPO to be granted, you must show that domestic violence is likely to be committed against you, and the court must be satisfied that the PPO is necessary for your protection. Will I certainly get a PPO if I have suffered physical injury? You are not guaranteed a PPO by simply showing that you have already suffered a physical injury. Remember, the court must be satisfied that you face the threat of future hurt or domestic violence, and that the PPO is necessary for your protection going forward. A PPO is a preventive measure, and not a penal measure. In the case of TED v TEE (see above), the court noted that the incident of family violence was an isolated one in the context of the parties’ entire marriage, and that parties had already commenced divorce proceedings and ceased living together. As such, it declined to grant the PPO application as it considered the likelihood of future instances of family violence being low, and that a PPO was therefore unnecessary. How do I apply for a PPO? You can submit an application for a PPO at the Protection Order Services at the Family Justice Courts (FJC), draft your application at your own convenience via iFAMS, the online portal of FJC, or go to one of the Family Violence Specialist Centres, which are, Centre for Promoting Alternatives to Violence, TRANS SAFE Centre or Care Corner Project StART to make a complaint through a video-link facility. In this first step, you will complete the standard Magistrate’s Complaint form. You may wish to bring along any relevant materials such as medical or police reports. After the Magistrate’s Complaint has been filed, you will be taken before a Magistrate to affirm your complaint. Following this, if your application is in order, the Judge or Magistrate will direct that a summons to the respondent (the offender) be issued. You are required to pay a prescribed fee for the issuance of the summons. After the summons has been issued, the case will proceed for mention. At this stage, the District Judge may order parties to attend counseling. If the parties choose to come to an agreement at this stage, the District Judge may make the orders needed. However, if the parties do not reach an agreement, the District Judge will order both parties to disclose any relevant documents such as medical or police reports, and set a trial date. While awaiting trial, the Complainant is eligible for a temporary PPO (see Expedited Orders, below) if the District Judge thinks the Complainant is at risk of being hurt by the Respondent. The actual trial will be heard before a Magistrate or District Judge in open court. The open court trial may take a few hours, a day, or even longer. If you are afraid of seeing the Respondent in court, a family member or friend can accompany you to court. Alternatively, if you inform a staff member at the Protection Order Services Unit at the FJC, it is possible to arrange for you to give evidence via a video-link from another location. Unless the offender has already agreed to the grant of a PPO, a PPO will only be ordered after a trial, when the judge is satisfied that domestic violence had been committed, and the Complainant needs to be protected. If you, as the complainant, are not satisfied with the outcome of the trial, you can appeal the matter in the High Court. What alternative forms of legal protection are available? An EO is an urgent PPO made before the trial. As per Section 66 of the Women’s Charter, the court has the power to grant an EO upon application of the PPO, if there is a high risk of physical injury to any family member. An EO is only valid for 28 days or till the trial begins, whichever is earlier. The offender is to be prohibited from entering the home, or parts of the home. The applicant is to be permitted to enter and remain in the home. It is important to note that the DEO only restricts the offender’s right to occupy the home, and does not affect his ownership of the property. What can I do if the offender violates the court order? If the offender contravenes the court order, you should immediately file a police report. As per Section 65(8) of the Women’s Charter, a breach of a PPO or DEO is a criminal offence. The first offence is punishable with a fine of up to $2,000 and/or a jail term of up to 6 months while a second or subsequent offence is punishable with a fine of up to $5,000 and/or a jail term of up to 12 months. Can I Change the court order? Once you have a PPO against someone, the order will be valid for life. If you wish, you can visit the Protection Order Services Unit at the FJC to change/vary or cancel the court order that has been issued. If you are experiencing domestic violence, or know someone who is experiencing domestic violence, do seek help immediately, either by visiting the Protection Order Services Unit at the FJC, or at one of the Family Violence Specialist Centres. If you can, do consider seeking legal advice or legal aid at an early stage and discussing with a lawyer the various options and orders that may be available to you. The lawyer may also be able to represent you if the PPO application is contested and goes to trial later on. Remember that there is a variety of court orders available, each of which can serve to protect you. Engaging a lawyer in your PPO application will allow you to devote more time to your own and your dependents’ well-being. Find a trustworthy lawyer who will help you to navigate the process, and resist frivolous defences (such as unjustified self-defence). A trustworthy lawyer would find alternatives for you and not waste time and money seeking to obtain a PPO when a PPO is an unsuitable remedy for you (as it was for the complainant in the case of TED v TEE). Last but not least, do confide in a trusted relative or friend and share what you are going through. You deserve a safe home, and you should never suffer in silence. If you have a legal question regarding being cheated, you can get a request for a quote from Lie Chin-Chin or other lawyers. With Quick Consult, you can check out in minutes and for a transparent, flat fee from S$49, the lawyers will call you back on the phone within 1-2 days to answer your questions and give you legal advice. This article is written by Lie Chin-Chin from Characterist LLC and edited by Kim Wong from Asian Law Students Association.